Finally a custard I can be proud of. 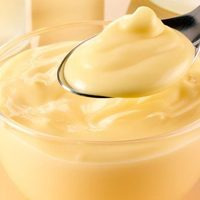 If you are looking for a simple vanilla custard that is creamy and smooth, then here it is. Don't worry about the banana and the hazelnut as they are just for rounding off flavor...but don't leave them out. You wont pick them out and they were just what I was looking for to fill in the gaps. Enjoy everyone. This recipe is the property of Aquaneo and released under the CC Attribution-Noncommercial 4.0 license. You may not copy, derive or commercialize this recipe without following the terms of this license or the explicit permission of the creator. This recipe is delicious, very creamy and savoury. The banana works well with this recipe, especially since im a banana fan. Starts off with a very nice velvet cream feel, and finishes off with the sweet tinge of Banana and Hazelnut. This recipe is my go to. I always have a few bottles in the drawer of my desk. I find a 2 week steep really settles the flavours together. Everything comes together for a nice sunday vape. This is one of my new favorite custard recipes. The banana hides very well...I can't pick out banana at all, but I can tell exactly which notes that it brings to the mix. The profile is plenty good, but I gotta give bonus points for subtlety here as well.